The latest Planet Money podcast–How Many Jobs Has Scott Walker Created?–was about whether government and politicians can actually create jobs. 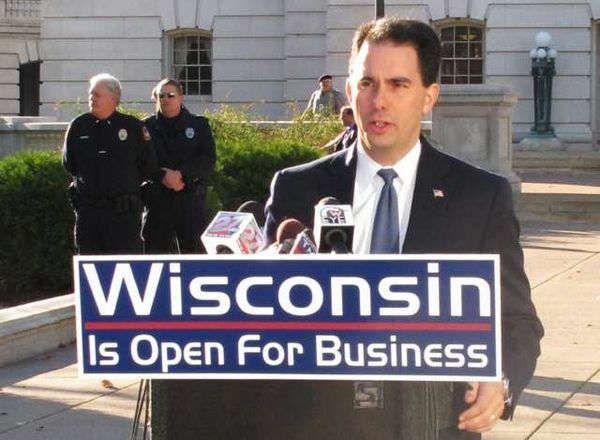 The Planet Money team focused on Wisconsin’s governor, Scott Walker, and rightly pointed out that his plan doesn’t seem to be creating jobs so much as allowing them to be created by local businesses. He’s mostly doing this via small tax incentives for companies who hire new employees (we’re talking like net $300 for the company for each new job created). They correctly concluded that this tiny amount of incentive has little to do with actually creating jobs–if a company is on the fence as to whether to hire new people, then a $300-per-person incentive might get them off the fence, but it’s only a useful incentive in marginal cases. CJW: Who specifically is going to be hiring because of your program? SW: Catalyst Exhibits that was from Crystal Lake, Illinois… We gave them an incentive to come up to the state of Wisconsin. They get a two year reprieve from state income tax. 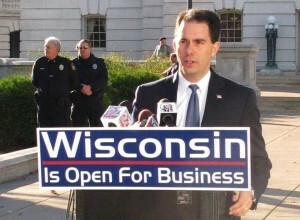 CJW: Is that creating jobs or is that just stealing jobs from some other state? SW: …It’s moving jobs. We’re giving them an incentive to move to the state of Wisconsin. CJW: You’re very aggressively promoting “Come to Wisconsin”, right? And that’s presumably jobs that would be created in other states nearby. So, there is some element of just taking them from other states and getting them for your state. AD: They focus a lot of attention on getting companies to move from some other state to their state. AD: …that doesn’t make our national economy do better. That’s not adding jobs or creating new industries. It just moves the pieces around the chess board a little bit. And that doesn’t really make for an overall healthier economy. AD: …there are ways to use the tax code to encourage short-term behavior for a small number of companies. But what the economists concluded was that really what government can do is long term. That’s where government has a shot at creating long-term job development. The implication is that Wisconsin (via Scott Walker’s plan) would coerce or trick companies to move from their current state to Wisconsin because there isn’t actual benefit to them moving. Or maybe they’re saying there is a benefit, but only to the company itself and not to Wisconsin or to the economy (state or national). This is ridiculous. Is there a benefit to the company? So, if NOM decides to move from Illinois to Wisconsin, they must see some sort real benefit. But it’s possible that only NOM benefits from the move, and that neither the local Wisconsin economy nor the national economy benefit. Are there national economic benefits when a company moves from state to state? Are there local economic benefits for Wisconsin when a company moves into the state? Of course, if Wisconsin continues to subsidize*** the new business (eg, by extending the reprieve), then the national economy would benefit at Wisconsin’s expense since NOM would be getting services paid for by other Wisconsin businesses and residents. This is competition, not “stealing”. The states are competing for business, and Wisconsin is trying to undercut other states’ prices (of operating a business) to get more business. It’s good for the consumer and the national economy. And it’s probably good for Wisconsin’s economy in the long-run, too. * I transcribed this stuff manually, and I may have made mistakes. Most of the stuff I quoted comes from the 17:30 mark. As always, I encourage you to listen to the podcast for yourself. ** I’m making some assumptions here. Namely that if NOM moves to Wisconsin and is able to operate cheaper, but doesn’t translate some of this into consumer surplus (meaning they keep all the savings as profit), then another competitor will step in and undercut them to get a tasty piece of that profit pie. If no one else would do it, then at least we could count on Urban Outfitters to copy NOM’s noms and sell them cheaper. *** I’m playing fast and loose with “subsidize” here. It’s technically not a subsidy because the government isn’t giving them money. But the government explicitly isn’t charging them money that it normally would. So it’s technically a tax incentive or tax break. Potato, potahto.